Division of Juvenile Justice (DJJ) Pine Grove Youth Conservation Camp staff, youthful offender firefighters, CALFIRE personnel, and community members celebrated a very special occasion on March 26; the 65th birthday of the longest operating fire conservation camp in the state. More than 300 visitors attended the event. They were greeted by office staff, setting the tone for the day as the afternoon sun warmed the foothills location. There were demonstrations of youth performing fire equipment drills, an expansive lunch, and an explanation of the treatment and programming efforts by DJJ to assist youth before they return to society on parole. Steve Kruse, Deputy Director of DJJ, was in attendance, and expressed his appreciation to the staff, youth, and the community in attendance. “Great job to all who had a hand in this wonderful event. Keep up the good work,” he said. CALFIRE was represented by a cadre of statewide and local officials. Most notably were Ken Pimlott, Deputy Director, Loren Snell, Assistant Deputy Director, Bill Holmes, Amador-El Dorado Unit Chief, and Dan Sendek, Staff Chief. A number of elected officials and community leaders were present. A partial list included all five Amador County Supervisors, District Attorney Todd Riebe, Sheriff Martin Ryan, Superior Court Judge Susan Harlan, and the City Managers from Ione, Jackson, and Sutter Creek. They were present to demonstrate their support of the Camp and to celebrate the long standing positive relationship the community enjoys with Pine Grove Camp. Youthful offender firefighters provided tours of the grounds, visiting hall, classrooms and dorm and talked about the training they receive to fight wild land and forest fires. Youthful offender tour guides, easily identified by their green polo shirts displaying the Camp logo, demonstrated their pride in the Camp and shared it willingly with the visitors. The staff presenters in the board room, school area, and nurse’s station were informative and well prepared. Visitors heard that youth who perform public service at the camp have a recidivism rate of about 25 percent – less than half the recidivism rate of youth who don’t serve in a camp program. On average, this camp generates about 150,000 public service hours to the community-at-large every year. The primary focus in the board room was an interactive display of the DJJ treatment program, known as the “Integrated Behavior Treatment Model”. This presentation, delivered by Case Managers Claudette Alessio, Richard Forster, and Denise Ding, with assistance by Supervising Case Worker Specialist Riann Giovacchini, was extremely popular. Community members formed a line out the door and down the hall to come in to hear about it. CDCR Secretary Matthew Cate, who attended the Open House, also visited the board room and asked probing questions about the treatment model and engaged each treatment staff about their experiences with the program. He was particularly interested in the work and educational profiles of the highly successful parolees versus those who were not quite as successful. The demonstration put on by one of CALFIRE’s wild land fire crews captured the crowd’s imagination. The simulated, emergency helispot landing by the Cal Star 10 helicopter provided some drama while underscoring the sober life and death operations performed by CALFIRE and DJJ Youth Camp personnel when the call for help comes. 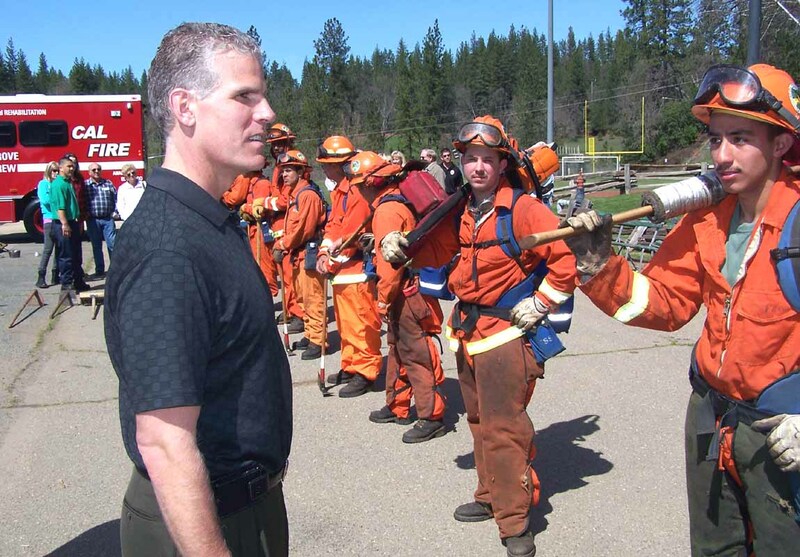 Secretary Cate reviewed an “operational tool up” by Crew Two led by CALFIRE Captain Martin King. Secretary Cate asked each youth questions about their role and watched the youth drill with their tools and as they assembled after exiting their Emergency Crew Vehicle. The support from Amador County, the Pine Grove community, former CYA, and current DJJ staff was enormous. A number of former Pine Grove Staff who worked at the Camp in the 1950’s and 1960’s visited “The Grove” and remarked at the changes that had occurred. They talked with other attendees about what the camp looked like prior to a 1969 renovation. The original camp buildings were constructed on site using local lumber and looked more like log cabins than the conventional frame buildings that replaced them. Retired CALFIRE Captain Steve Huntington, who served as the Camp’s principal trainer for wild land firefighters for many years, added a historical flair with his display of 1940 era firefighting equipment used at the camp. Visitors remarked at how well-maintained the Camp grounds looked. Attendees also commented on the expansive lunch prepared by Supervising Cook Cynthia Wilson with assistance by Cook II Sharon Bauer and youth culinary workers that staff the kitchen. Wilson spent the last several weeks planning the meal and working with the community to coordinate donations for everything from table cloths and decorations to extra tables and chairs for the expected crowds. The waiters were attired in all white uniforms with designated service areas. Each had received extensive training in tableside protocol and customer service. While the waiters didn’t receive tips, the guests made frequent positive comments about the level of their social skills and attentiveness. Beef Loin Medallions in a rich mushroom sauce and a creamy Chicken Marsala were the main course selections accompanied by rosemary encrusted al dente red potatoes and carrots. Dessert included assorted cheesecakes and a strawberry infused multilayered cake which served as the ceremonial birthday cake. Pine Grove Superintendent Mike Roots said the youth firefighters had been looking forward to this day for months.